Back in 1998 I went on a road trip to Montana with my trusty giant (20 pound) 8'' screen TV, an N64, and a copy of Banjo Kazooie I was borrowing from a friend. During one of the more exciting journeys of my childhood I beat what I remember as being one of the best 3D adventure games ever made! If the save files from my friends' cartridges bear (no pun intended) any resemblance to my own skill at gaming, it probably took between 20-40 hours to get through the game with a 100% completion rate, completely unassisted by strategy guide or the internet (which wasn't a particularly useful thing at that time for walkthroughs). I've been trying to get my hands on a copy of Banjo Kazooie ever since and this weekend, a full 15 years later, I had a chance to pick it up, plug the very same N64 (complete with an expansion pack) into a 19'' flat screen, and use the same controller I used back in the day! 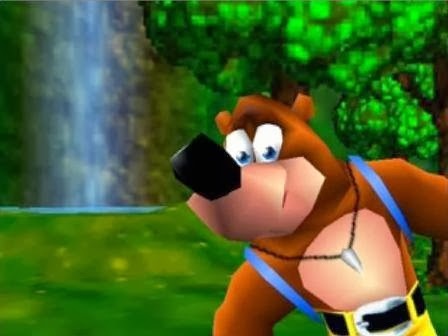 I was extremely curious how good the game would still be and wondered with dread if perhaps I remembered Banjo Kazooie to be more fantastic than it actually was. The plot is about as deep as one can expect from an All Ages game. You're a big brother bear named Banjo and your little sister bear, Tootie (named such because she plays the flute) is kidnapped by a witch named Gruntilda. Gruntilda wants to steal Tootie's youthful looks so you and your bird-friend, Kazooie (who lives in your backpack) need to rescue her so this doesn't happen. 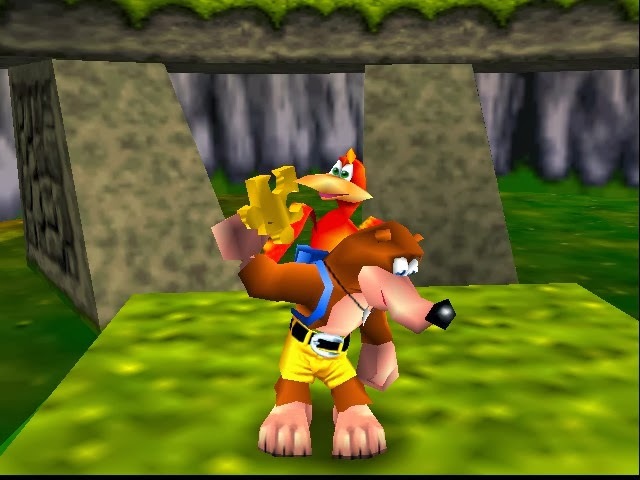 The moment I had control over Banjo and Kazooie the muscle memories from years past told me to try all sorts of jumping moves that didn't seem to work. At first I thought that perhaps I was thinking of the controls for another game but after I talked to Bottles the Mole I quickly re-discovered that you need to learn all of the various moves throughout the course of playing the game by finding mole-hills and having brief yet comical exchanges with Bottles. A few such exchanges and two stages later I found my skills rivaling the apex of my childhood. I was able beat entire levels without dying and questioned if it was just an easy game by today's standards or if perhaps I was just really good at Banjo Kazooie. A few more stages, by Mad Monster Mansion, I discovered that the game has a fairly balanced difficulty curve and found myself genuinely challenged. Rare did a good job with balancing an ever-increasing difficulty without inducing crippling and entirely unenjoyable difficulty spikes found in games like Psychonauts. The controls of Banjo Kazooe felt alright, even by today's standards. Banjo and Kazooie a fairly responsive and easy to control for the most part but it's sometimes tough to judge exactly where you are spatially, like when you're trying to jump from one floating object to another, or when your trying to judge the correct distance for an attack against a large enemy. It's often hard to judge how close/far you are from objects and creatures when swimming, flying, or even walking in some instances and I often found myself dancing around the pickup items. I think this can be attributed to lack of shading or shadow effects, which is something that can be blamed on the game's age. 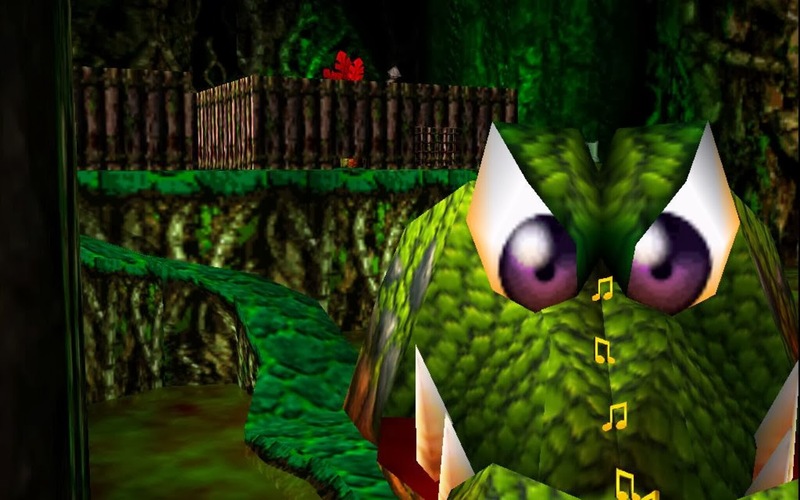 There were only three things I outright disliked in Banjo Kazooie. Swimming underwater felt slow, clunkly, and difficult to control, especially if you're not inclined towards Y-inversion. This made underwater item pickups frustrating because even if I knew what I wanted to do and how to do it I generally couldn't because of the lack of depth perception. Another mechanic I really disliked was shooting eggs. I found it to be extremely difficult to aim eggs (a projectile you shoot) at distances greater than point blank. This was only mildly frustrating by comparison to swimming because in the few instances where you need to shoot eggs you are only required a lucky shot or three, and egg ammunition is plentiful. I also noticed that there were a number of seemingly difficult-to-reach but utterly useless rooms you could reach that pertained to secrets that only affect the game's sequel(! ), but that otherwise had no purpose. About half of the game's levels seemed to contain such a secret rooms and I found myself aggravated at the lack of in-game explanation, and the amount of time I spent scouring those empty rooms in confusion, looking for hidden notes or puzzle pieces that just weren't there. 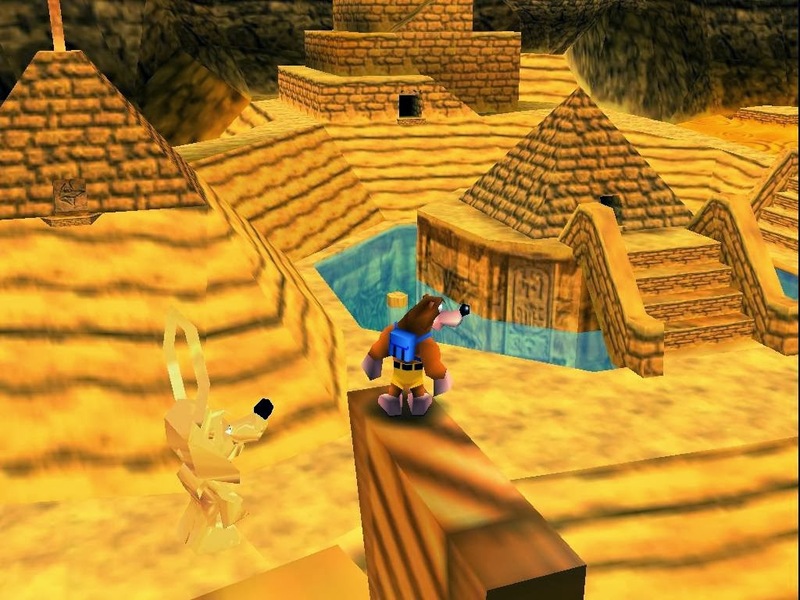 After playing through 15 additional years of platformers and adventure games it also felt like there should have been a ledge-climbing mechanic in Banjo Kazooie, which my brain subconsciously noticed was missing. You can jump into ledges, you can jump over ledges, and you can climb trees, but you can't attach yourself to a ledge and climb up it (or drop from it). Mario 64 (a console release title) featured this mechanic so I don't think it was a system limitation. Between the quirky but expansive level design, Mumbo Jumbo's ability to turn you into various magical "creatures", and the ability to fly gained early on in the game there really isn't much of the game that feels unexplored if you attempt a 100% completion playthrough. 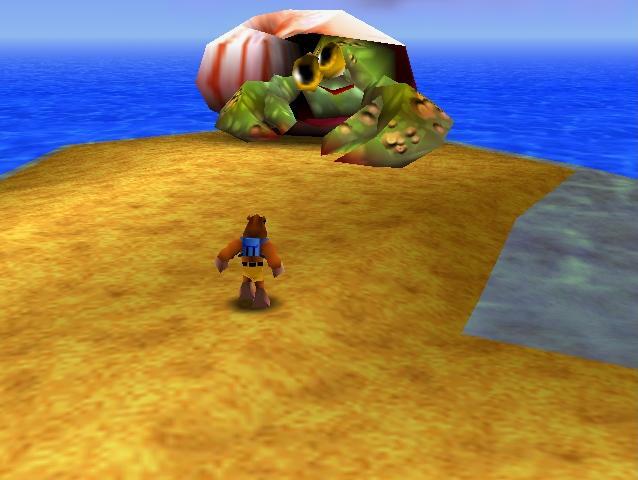 Before the days where games pointed you in a direction with a giant arrow, a minimap with a giant marker, and a HuD that obscured 25% of your screen, there were games like Banjo Kazooie that told you "there are 10 puzzle pieces, 100 notes, and a few Jinjo's hidden in each level. Good luck finding all that, get lost in any direction you'd like, and have fun!" There was a sense of true exploration throughout each level and I was really glad to reexperience that. It's surprisingly fresh when not 8 hours before I was playing an unnamed modern game where giant looming markers and flashing lights show you where to go on a screen obscured by HuD, or in other games where the level design is so bad that you literally need to follow the mini-map for guidance and just ignore what you actually see on the game's main screen. Banjo Kazooie inspires a sense of excitement when you're exploring the levels by not force-feeding you directions and allows you the freedom of multiple paths... which ultimately lead to the paths you didn't take but it's the illusion of freedom that this game gets right and the cheery sense of achievement you feel when you complete each level with 100% efficiency. The game also throws some silly things things at you like Gruntilda's sister, who tells you all sorts of silly facts about the witch, like the name of her band in highschool. The art direction is toonish and despite the issues with depth perception that I mentioned earlier the game's graphics were revolutionary for its time and withstand the test of time as far as I'm concerned. They're not bad and they'd be considered stylistic if you saw them in a new release. At worst, they're about on the same level as the games Nintendo is still releasing on the 3DS. In terms of music I feel that the soundtrack to Banjo Kazooie was well done. The arrangements are simple, a little hokey perhaps, but the songs constantly change and evolve as you're interacting with the environment. Each stage has a distinct song and within each stage exists several renditions of that song affected by your physical location within the world. Are you walking into a dark and creepy cave? The music for the level will seamlessly become a slightly more creepy version of the same song played on a digital xylophone. This feels fairly advanced for its time and is still an example of what solid interactive audio design can be. 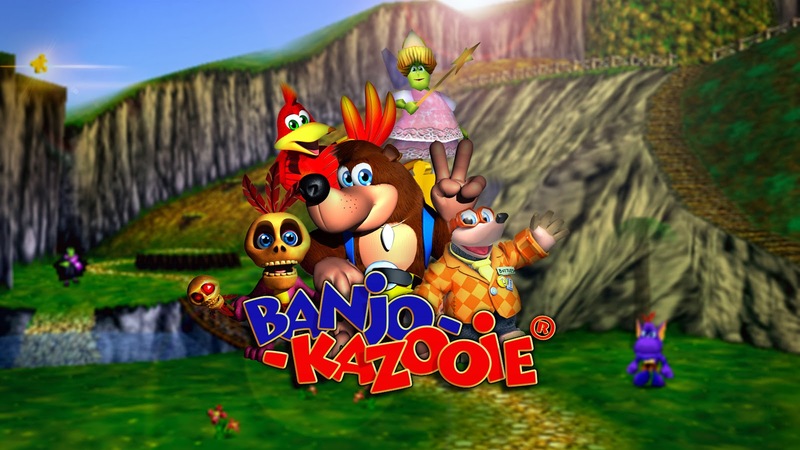 Banjo Kazooie has survived the test of time and in my opinion will always be a solid classic that future gamers can enjoy and seasoned ones can return to time and time again. 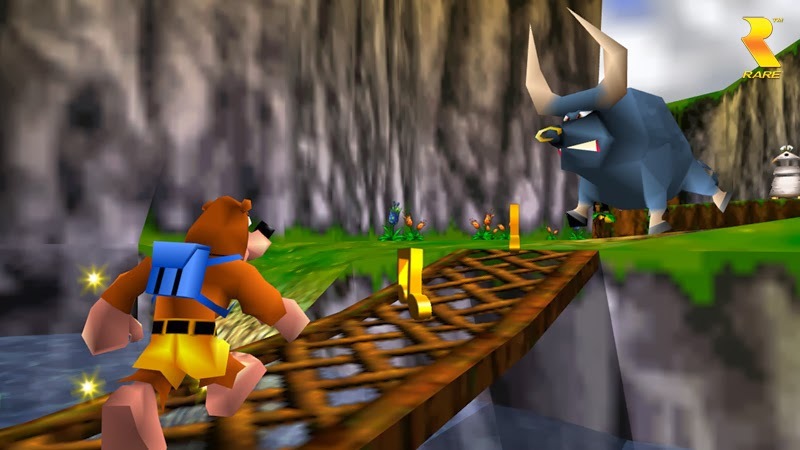 I can see myself returning to play it in the future, which is rare, though I still have yet to try out the sequel: Banjo Tooie.